21 From that time on, Jesus began to show his disciples that he must go to Jerusalem and suffer greatly from the elders, the chief priests, and the scribes, and be killed and on the third day be raised. 22 Then Peter took him aside and began to rebuke him, “God forbid, Lord! No such thing shall ever happen to you.” 23 He turned and said to Peter, “Get behind me, Satan! You are an obstacle to me. You are thinking not as God does, but as human beings do.”24 Then Jesus said to his disciples, “Whoever wishes to come after me must deny himself, take up his cross, and follow me. 25 For whoever wishes to save his life will lose it, but whoever loses his life for my sake will find it. 26What profit would there be for one to gain the whole world and forfeit his life? Or what can one give in exchange for his life? 27 For the Son of Man will come with his angels in his Father’s glory, and then he will repay everyone according to his conduct. Why would Jesus seem to see Satan lurking in His disciple, Peter, especially since only a moment before, Jesus promised the keys of Heaven to Peter? Yet, this made me think of Christ’s actual encounter with Satan himself. After all, Jesus encountered Satan before. After being baptized, Christ went to the desert for forty days, after which he was tempted by Satan. Much art has been made of this temptation, but I would love to focus on this stunning picture by Duccio. Satan looks just as He is; a fallen angel, dark and wild from living on the Earth. He points to the kingdoms of the earth from on high, but Jesus sends him away. And, in the meantime, angels who are still aligned with God, wait for Jesus to be finished defeating Satan in this particular battle so they can minister to Him as soon as Jesus is ready for them. 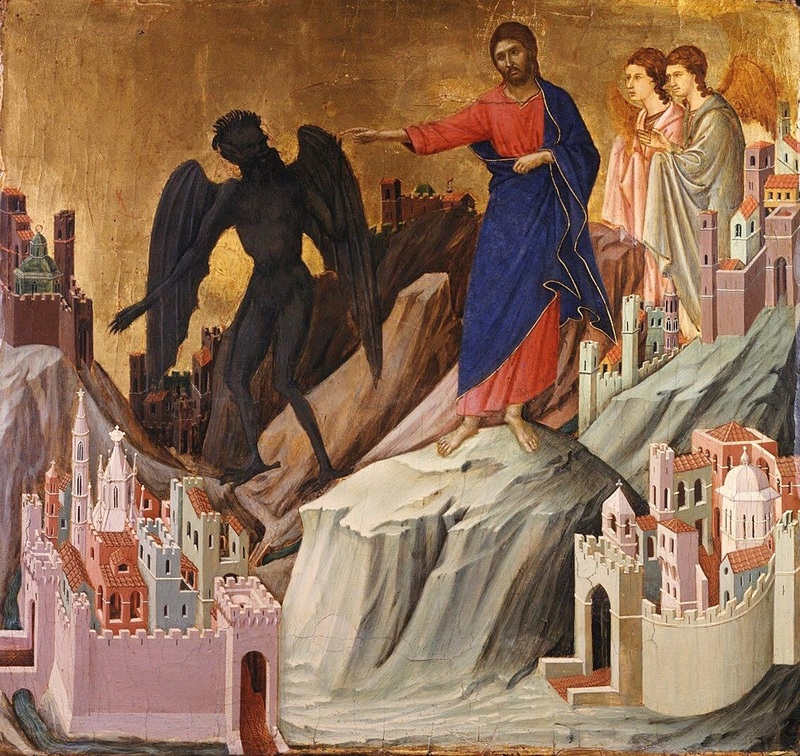 The Temptation of Christ on the Mountain, by Duccio di Buoninsegna, c. 1308-11. The Frick Collection Museum, New York, New York, United States. 1 Then Jesus was led by the Spirit into the desert to be tempted by the devil. 2 He fasted for forty days and forty nights, and afterwards he was hungry. 3The tempter approached and said to him, “If you are the Son of God, command that these stones become loaves of bread.” 4 He said in reply, “It is written:‘One does not live by bread alone,but by every word that comes forth from the mouth of God.’”5 Then the devil took him to the holy city, and made him stand on the parapet of the temple, 6and said to him, “If you are the Son of God, throw yourself down. For it is written:‘He will command his angels concerning you’and ‘with their hands they will support you,lest you dash your foot against a stone.’”7Jesus answered him, “Again it is written, ‘You shall not put the Lord, your God, to the test.’” 8Then the devil took him up to a very high mountain, and showed him all the kingdoms of the world in their magnificence, 9and he said to him, “All these I shall give to you, if you will prostrate yourself and worship me.” 10At this, Jesus said to him, “Get away, Satan! It is written:‘The Lord, your God, shall you worshipand him alone shall you serve.’”11Then the devil left him and, behold, angels came and ministered to him. At this particular moment, Jesus has been fasting for forty days in the desert. He’s probably at the point where he is near starving. Most people would do anything for food at this point. After all, in the Old Testament (Genesis 25:29-34, to be exact! ), Esau gave up his birthright to Jacob for a hunk of bread and a bowl of lentil soup, just because he was hungry. Was that a mistake? Well… yes. By demanding food at that very minute, he pretty much doomed his path of life, since he cast away his claim to the birthright. Which, in effect, meant he was casting off his entire family and everything he had worked for his entire life. And for what? A hunk of bread and a bowl of lentil soup. But Jesus refuses this offer of food. And then there’s safety. Most people want to be safe, and they will do everything in their power to keep safe. In the novel, 1984, towards the end of the book, Winston betrays Julie, his lover, friend, and confidant. And why? Because he doesn’t like rats. He really, really doesn’t like rats. And Big Brother knows this. So, they threaten to release rats on Winston… and he finally breaks down and begs for them to do it to Julie instead. Why would he betray her? Because of safety. He wants to be safe. And he would do anything to stay safe, no matter how much it will destroy another person. But Jesus refuses this offer of safety. And then power. In many video games, there is a certain cheat built into the game called “god-mode” which gives the player the ultimate power in the video game — invincibility and the ability to destroy any of the enemies that need to be destroyed. Why is it called “god-mode”? Because it is assumed that if one has the ultimate power of invincibility and destruction, one would wield that power for their own means. But Jesus refuses this offer of power. Mind you, wanting food, safety, and power, by itself, is not bad. One can wish to eat, wish to live in safety, and wish to be the chairman of the PTA board without following Satan. But, to go the extremes… to cast aside everything good in your life to be able to eat. To wish for safety to such a great extent that you are willing to destroy another person, if it means that you are kept safe. To yield ultimate power to destroy anyone you wish. These are desires that come from Satan. Now, let’s go back to Peter, who draws Jesus aside and suggests that Jesus does not have to go through the suffering and death that Jesus fully intends to do. Why? Because Peter knows that Jesus is God. And Peter believes that, since Jesus is God, Jesus doesn’t have to suffer. He can be safe. He can be powerful. He need not suffer and die at all. He can just go “god-mode” on everyone. And, in this way, Peter is suggesting the very same temptations that Satan had previously tempted Jesus with. But Jesus does not want to win the world. If He had, perhaps He would have taken up Satan’s offer. Instead, Jesus wants to unite us to Him so that we may be united with God, who is love. And so He urges His disciples to take up their cross and follow Him. And, in doing so, He encourages us to do the same. And, spoiler alert? Through this cross, Jesus is able to destroy the hold of Satan has on all of us — and adopt us as His own. Thank You for showing us how to defeat Satan by taking up our crosses and following You. Grant us the wisdom to be able to discern what is good for us according to Your Word and the strength to follow You.